We start with natural chicken Raised Without Antibiotics as the #1 ingredient. Our recipes are made with a precise blend of natural ingredients, antioxidants, vitamins and minerals expressly blended for optimal nutrition. We guarantee that the natural chicken contained in each and every Tender & True Antibiotic Free Premium Chicken & Brown Rice Recipe pet product has been certified humanely raised by the Global Animal Partnership, a third-party nonprofit charitable organization, founded in 2008, that brings together farmers, scientists, ranchers, retailers, and animal advocates to improve the welfare of animals in agriculture. Promoting and facilitating continuous improvement in animal agriculture is one of its core missions and why GAP developed its signature initiative – the 5-Step Animal Welfare Rating Standards. Chicken, Water sufficient for processing, Pea flour, Chicken liver, Brown rice flour, Salmon oil (preserved with mixed tocopherols), Salt, Calcium carbonate, Agar-agar, Choline chloride, Sodium phosphate, Chicken broth, Potassium chloride, Taurine, Magnesium proteinate, DL-Methionine, Tricalcium phosphate, Zinc proteinate, Iron proteinate, Vitamin E supplement, Thiamine mononitrate, Niacin supplement, Calcium pantothenate, Copper proteinate, Biotin, Vitamin A supplement, Manganese proteinate, Sodium selenite, Riboflavin supplement, Vitamin B12 supplement, Pyridoxine hydrochloride, Calcium iodate, Vitamin D3 supplement, Folic acid. 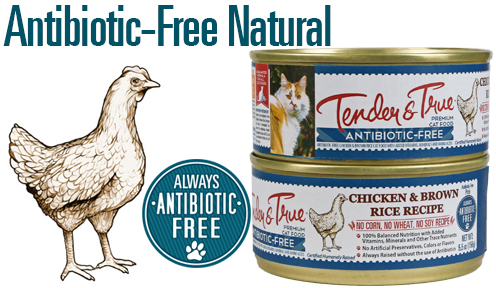 Tender & True Antibiotic-Free Chicken & Brown Rice Recipe Premium Cat Food is formulated to meet the nutritional levels established by the AAFCO Cat Food Nutrient Profiles for all stages of life. FEEDING INSTRUCTIONS: For adult cats feed 1 3/4 cans per day per each 7 pounds of body weight. For pregnant and nursing mothers and for kittens up to 1 year of age feed up to 3 times as much as for adults or up to 5 cans per day. The amount of food your cat requires will depend on activity, age, environment and breed. Feed at room temperature and refrigerate unused portion in a non-metallic container. Remember to always keep fresh, clean drinking water available for your cat. Kittens up to six months may require up to 2 to 3 times more food than adult cats the same weight. Either free feed or feed 3 to 4 times daily during first year. Pregnant and lactating cats should be fed free choice. Senior and overweight cats may be fed a reduced amount, depending on the cat’s weight and activity level. If you feed more than once per day, simply divide the Daily Feeding Guidelines by the number of times fed per day. FRESH WATER: Be sure to have a clean bowl of cool, fresh water available at all times. New to this food? Please transition your pet. When changing to Tender & True ABF Premium Chicken & Brown Rice Recipe Cat Food, some cats may do better by making a gradual transition over 7 days. Start with 25% of the new food mixed with 75% of the previous diet, and gradually increase the new while decreasing the previous until the transition is complete. Like the natural poultry raised without antibiotics you have an opportunity to purchase from your butcher, we believe your cats deserve to receive the same high-quality, raised without antibiotics natural chicken in their pet food. That is why we created Tender & True Antibiotic-Free Premium Chicken & Brown Rice Recipe Cat Food. All natural poultry are raised without antibiotics to our exact protocols with 100% vegetarian diets and are certified humanely raised by the Global Animal Partnership (GAP). We never use antibiotics or growth hormones. We allow our animals to grow at their natural pace in a comfortable, reduced stress environment – in spacious ranches with plenty of room to roam, fresh air and continuous access to food and water. We start with natural chicken raised without antibiotics as the #1 ingredient within all of our Antibiotic-Free Natural pet foods. Our recipes are made with a precise blend of natural ingredients, antioxidants, vitamins and minerals expressly blended for optimal nutrition. No corn, wheat or soy is added to our recipes. Additionally, no artificial preservatives, colors or flavors are included in our premium pet food. Formulated by our pet food nutritionists, Tender & True Antibiotic-Free Premium Chicken & Brown Rice Recipe Cat Food is formulated specifically for all cat breeds throughout all life stages.